Ack! I swallowed a bug! First off, just a reminder that I am actively setting up projects for late June and July. I also have two slots each still open for the two Imperial Guard specials. Not too late for that. 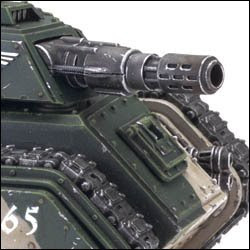 I’ll even sweeten the deal: if you use both types of special (ie Massed Infantry and 3×3 Tanks) I’ll get your materials at 31% off (if’n you need us to get them). I slept in this morning. I got up and made three waffles with whipped cream and real maple syrup. I prefer imitation, truth be told. It’s chemically engineered for my tasting pleasure. My wife headed out to the farm co-op to pick up our food: artichokes, bananas, fresh bread, potatoes, asparagus. I cooked up some of these vegetables in olive oil, butter, salt and pepper and had that for an early lunch then headed down to the studio. I got all the raw footage shot for a new batrep: Oceanic Eldar vs. Ultramarines. Yes again. I realized that I’ve played four games with my Eldar and all of them against Marines. I think I’m going to gag if I have to play Eldar v Marines again. So, I brought home some Orks to paint over the weekend, and I hope to make some good headway there. By this time next week they should all be done if I stay focussed. Right now, I am slogging through the masses of infantry which is the hardest part. 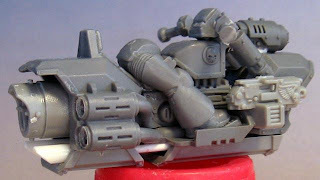 I picked a difficult schlep-tastic way to paint them, but I think it will have a good result– a bolder look befitting Orks! Upon arrival at home I found that my wife had managed to bargain-hunt three bikes for $65 (total). There’s a guy locally who refurbishes them in his garage. I think as the economy tanks you’ll see more of this type of thing; impromptu home-businesses. People will discover that they can do just fine for themselves, and a community can take care of every problem within itself. It’s my opinion, as you know, that a city can solve almost everything, that’s the level of goverment that feels good to me. The city I live in is on a plateau at the foot of the mountains. A high-land desert. Well, on the southern edge of this plateau are several roads, and they overlook farmland and copses of trees. To the East the mountains tower like cones of green and brown and white. In the pass are gargantuan windmills, their white blades circling slowly. To the west are more distand peaks and a sunset beyond white clouds. The wheat is high and green. It’s a great place to go for a walk or a bike ride. While painting the Orks my wife brought me a BLT and a sprite. That was a bit of paradise. 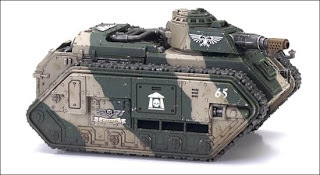 With the advent of the new Imperial Guard codex, tanks have a lot more options. 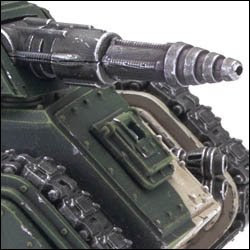 The Hellhound has three variants, and the Leman Russ has six. Each kit comes with only one option (ie the box only has one kind of turret in it). Not for long. New kits for both are in the works. What you see above is the new Hellhound kit, with all variants. 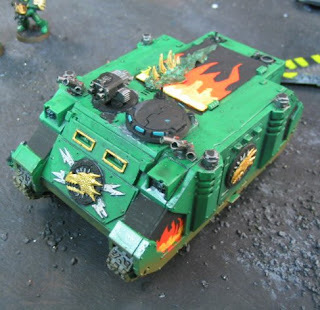 This incredibly versatile kit not only includes all the weapon options available to the Hellhound Flame Tank, but can also be built as either a Devil Dog or Bane Wolf. It’s been a few days since I made a post. It’s been really busy down at the studio, be we are getting caught up. There’s been a logjam in assembly, but that is near to being cleared. It’s a natural push and pull; sometimes a lot of clients want their models assembled (instead of sending them in all ready to paint). We like doing the assembly, don’t get me wrong. I am still setting up projects for June, still time to get on board. Things are wide open in July. I am completely at your disposal for any matter. I’m done with the Oceanic Eldar. The only thing I might add would be a couple of Falcon Turrets (to switch out with the Night Spinners) and maaaaybe a Scorpion Grav Tank. That would bring it to 3000 pts. It’s a generous 2400 points now. The orks are in process. I’ve got about twenty more boys assembled up with some conversions to make them a little different (eg different close combat weapons). That’s a solid 1500 pts already. I’m actually quite excited to play them. It’ll be a nice change of pace from prancing around with the Eldar. I’ve been really stressing out recently. There were some unexpected expenses this last month and that really put the hurt on. We’ve all been there. Running a business has some insane pressures. But as time wears on I don’t get as worked up each time. I’m getting tougher. Most of my problems are financial or adminstrative in nature. I think this will prepare me for future challenges. Last night I was snuggled in bed with my wife, the window open to the spring air, the gentle chirping of crickets outside. And the rustle of gentle wind in the aspens. We watched Iron Man on her laptop and ate rice krispie treats with a huge glass of ice cold milk. The baby was up at 3am, and again at 6am, so I just got started right off. The kids were all asleep helter skelter in the living room. Summer break is a magical time. My wife and I are firm believers in unstructured time; we don’t like to have our kids in too many programs, if any. When I was growing up the only activity I was really involved in was D&D. I had almost complete freedom to come and go as I pleased from age 12. I had a GREAT childhood to say the least. Anyway, Sarah is out this week. She’s spending some summertime with her family, so I’m pulling double duty. The happiness level is down about 40%. For lunch today my wife showed up with three of the four kids. We picked up some cheap chinese lunch special and headed back to the studio for some Magic with Renn and Joseph. What else? Still got those various armies. A box full of Lord of the Rings and another full of Khador; Chaos Mortals ready to go, too. I should do a studio update tomorrow. 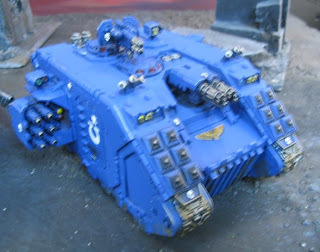 I haven’t done one because the main table is strewn with painting materials and various Orks. A good friend of mine moved away today. I am very sad. It’s fun to see how it looks from the other side. This is really neat. We could do a bunch of these with parts we have on hand. I have some major bills due at the end of this month. I am ready to part with virtually anything at the studio. I’m thinking mostly of the various armies. Please email me at bluetablepainting@gmail.com if interested. I’ve got a great crew and we’re all ready to work. I am at your disposal for any matter. For memorial day we went to the local cemetary to visit the war memorial and explain to our kids what it was all about. 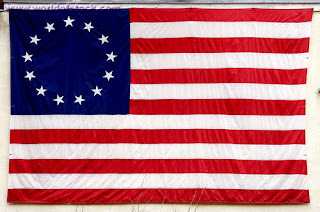 For myself, I feel grateful to those that have died in the cause of Liberty and the defense of our Rights as humans, wherever that cause has been taken up, especially those that risked all in the dark times of the American Revolutionary War. To this day we are the inheritors of the Bill of Rights, which to me is worthy of life itself. I leave you, kind reader, with good will and highest hopes, these quotes from Thomas Jefferson. The weather here in Utah Valley is gorgeous. There are huge plumes of white and grey clouds coming over the himalaya-like mountains to the east. 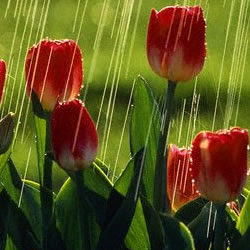 It’s a springtime rain, temperate air and wet streets. I find the sound of thunder comforting. This morning I was starting to feel weary. And generally so. Like a thick pall of darkness. I didn’t want to go to church. I was two inches away from saying “bag it” and staying in bed. But I didn’t. I got the kids dressed and off I went. I’m glad I did. I just can’t stay in a bad mood when I’m there. I got home and my angelic wife fried up some chicken. Orange juice, and vanilla ice cream for dessert. Then off to home teaching. Saturday my wife and I tore into the garage. It was dirty work. And we found petrified layers of junk under the other layers of junk. After that I headed to work, but had to call it short due to a splitting sinus headache. All that dust probably got to me. I regularly get emails thanking me and my crew for our enthusiasm and inspiration. That really gives me a lift. I would encourage those that like what BTP stands for, and what we do, to get going and place an order. We are ready to work, and to stand behind our product. I think that this refers to daydreaming; what am I thinking about all the time? What am I fretting about? Imagine a man standing in a paradaisical sunlit glade, but that he has two discs of blackness over his eyes (his troubles, his worries, his obsessions). I think that sometimes I am blinded to the rich blessings all around me. I met Bill at Adepticon. He’s quite an exuberant fellow. I wish I could have chatted with him more.